Apple is making it easier on your wallet to give your sweetie a MacBook Pro with Retina display or a MacBook Air for Valentine’s Day. The company announced today that it’s dropping the laptops’ prices and upping their specs, effective today online and in retail stores. 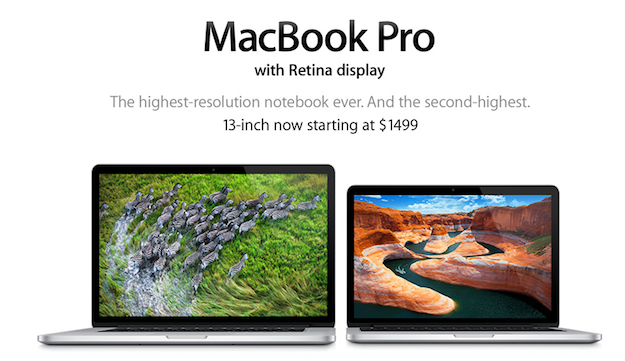 You can get the 13-inch Pro with Retina and 128GB of SSD for $1,500, which saves you $200. Not a bad reward for holding out in hopes of a price drop. Want a bigger hard drive? For $1,700, you can get the 256GB version with 2.6GHz processor. Or, if you’re looking for something a little more lightweight, you can get a 13-inch Air with a 256GB solid-state drive (but without the glorious Retina display) for $1,400 – that’s a $100 savings from the original price. For the big spender who wants to impress with the best MacBook Pro money can buy, Apple is upping its processors. You can now get a 15-inch Pro with Retina display with a blazingly fast 2.7GHz quad-core Intel Core i7 processor and 16GB of memory. That is, if you’re willing to drop a whopping $2,800 for it. After stores like Amazon and Best Buy were knocking down prices of Retina MacBook Pros and MacBook Airs, it was only a matter of time before we saw Apple discount the products themselves. With Mac sales plummeting by more than 21 percent, the lower price may be the only thing that’ll turn those numbers around.